Floral stamp – Crafty Individuals – both flower panels are on this stamp (like a diptych) and I just cut them apart for this sketch. This was very simple and the design was very pleasing. I based it on the sketch at Operation Write Home: Sketch Challenge #72. I just colored the stamped image with Copic markers. 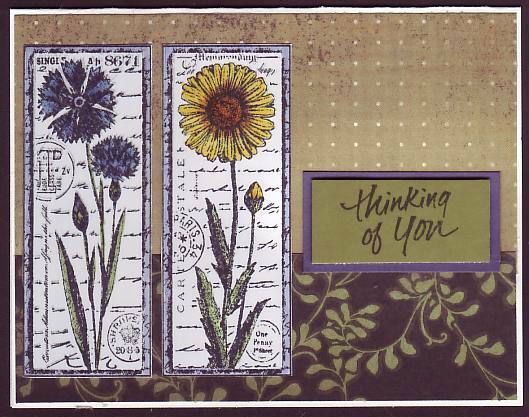 I tried to choose cardstock for the sentiment that matches some of the colors in the flowers. Thanks for checking-in. This entry was posted on Monday, June 6th, 2011 at 10:32 pm	and tagged with cardmaking, clean and simple stamping, stamping and posted in Challenges, General Cards, OWH. You can follow any responses to this entry through the RSS 2.0 feed. Very nice, Yvonne! I love that botanical stamp and how you cut it into panels. Thanks for joining us in this week’s OWH Stars & Stamps Sketch Challenge! Gorgeous, Yvonne! Darn, I just promised myself I won’t buy anything for awhile and there’s that awesome flower stamp, lol! I love your background papers; they make such a soft and elegant setting for the flowers. Beautiful! very pretty coloring of the flowers, neat idea to seperate them!